Lord Bingo News Bingo Promotions What Will You Find At Sugar Bingo? What Will You Find At Sugar Bingo? Apart from the major sugar rush and irresistible treats, Sugar Bingo has a lot to offer. The home page already lets you sit and admire the layout. With gingerbread men, colourful rainbow streets and different types of gingerbread houses, there’s more to discover. At Sugar Bingo, find a variety of promotions, bingo and slots to play on! The slots page offers you slots of different stake amounts, various paylines, perfect features and the most exquisite themes. The games also come from the best game providers. Meaning, you could always expect an exotic feel to new slot games. With the classics available, such as: Fluffy Favourites slots, Starburst slots, Gonzo’s Quest slots, and Rainbow Riches slots. Stand a chance to increase your bankroll on the other worthwhile slot games. Find differently priced tickets here at Sugar Bingo. Depending on the kind of room you’re choosing to play in, the card prices are much varied. The mouth water collection of bingo games contains irresistible jackpots. Enjoy the wide variation of guaranteed progressive jackpots on a daily, weekly and monthly basis. You will certainly like the refreshing, fun and relaxing atmosphere of the chat rooms. Play the charm of chat games and increase the amounts of prizes you receive on a daily basis. 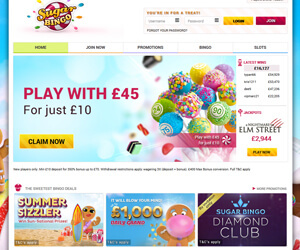 Also, enjoy bingo on the go, as Sugar Bingo is a very responsive site. You could play on your mobile or tablet from anywhere you like. Treat yourself to the mouth-watering promos at Sugar Bingo. Receive a 300% bonus on a £5 deposit and a 350% bonus on £10. The maximum you can deposit £20 and you get to play with £70! Celebrate summer with Mr Hot Gingerbread Man. Join the game to win amazing prizes like: A trip to Paris for two, a hotel and spa giveaway, a smart HD TV! 1TG’s and 2TG’s get to walk away with Amazon gift cards. To top it off, to increase your winning chances, and grab your free bingo cards. Grab your ticket to the mega monthly jackpot for your chance to win £1,000,000 with £1,000 guaranteed! Simply mark your calendar on the 3rd or every month at 11pm and grab your £1 tickets. You can read more about Sugar Bingo here.